PhenixID Authentication Services can be used as an OpenID Connect Provider, ie handling the authorization of users and issuing tokens to the relying parties on behalf of the users. 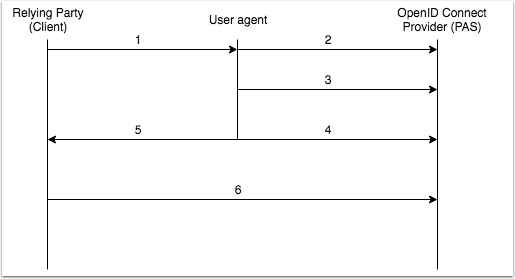 The picture below illustrates the data flow in OpenIDConnect Authorization Code flow. The relying party (client) can be a web application, a native mobile app, a rich client application or any system/platform/device/service. The user agent can be the system web browser or a web browser component built inside the relying party client. PhenixID recommends to use the system web browser. Using the system web browser will make Single-Sign-On (SSO) feasible between apps and systems. 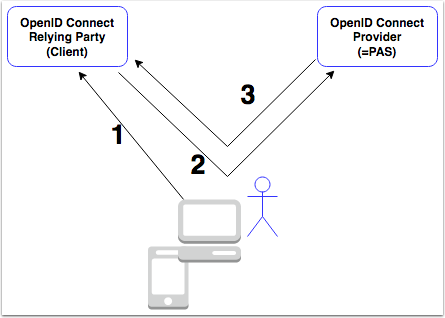 The OpenID Connect Provider (PAS) provides an authorization endpoint URL for user authentication. For authorization code flow, it also provides a token endpoint URL for token issuing. 2. PAS will verify the client_id and redirect_uri against configured relying party trust configuration. PAS will prompt for authentication. 3. User authenticates. Depending on the authentication method, several calls from the user agent to PAS might occur. 5. User agent will launch URL from 4. This will trigger the relying party client. The relying party client will receive the code from the URL. PAS will return a signed OpenIDConnect JWT IDToken. This token contains information about the end user that performed the successful authentication. The relying party will validate the JWT token (signature and other attributes). If validation is ok, the user is granted access to the relying party. User opens application/app and clicks Login. - response_type Must be id_token or id_token token for this flow. - state [Optional] State value passed by the RP. Same parameter, unchanged, will be returned to the RP with the token. - nonce [OPTIONAL] Value to strengthen security and avoid man-in-the-middle attacks. The exact same value will be returned as a token claim. By using this, the RP can make sure the token belongs to a authorization request. Recommended to use. If authentication was successful, PAS will redirect the user agent to the redirect_uri. The encoded id_token (jwt format) will be added to the response. If responsetype included token, an access token is appended to the response. After authentication, the user agent is redirected to redirect_uri with an id_token. The RP must verify the signature using the public certificate that was given out by the PAS administrator.